In Malifaux each crew is led by a Master. 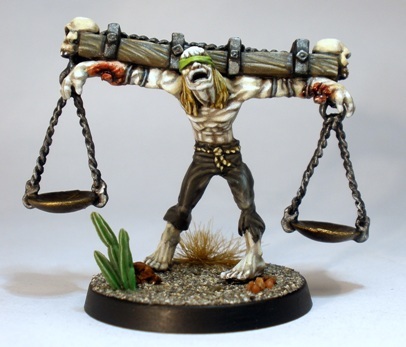 Nearly all Masters have a Totem that is theirs alone: some form of manifestation of an aspect of a Masters psyche made flesh due to the magic forces that Malifaux is saturated in. The figure above is the Scales of Justice, the Totem of Lady Justice. I dont know what is supposed to be going on in Lady J’s head, but seeing as this unhappy looking guy represents those thoughts given form, I am probably better off. The concept of the figure doesnt really do anything for me. The blind justice thing is already amply displayed by the Lady J figure and it was unnecessary to ladle it on here I think. Maybe its just me, but the strong visual links to crucifiction looks to me like the original figure concept sprung from the mind of someone heavily weighed down by Catholic guilt. As someone who is not weighed down by same but who happens to live in a country with a large percentage of fruit loops who are, the figure design is a bit of a turn off. I bought the Totem simply because it is an easy fit into the game, but I think that perhaps I should have come up with a proxy miniature more to my liking instead. The sculpting on the figure is good and it was easy enough to paint. The casting was acceptable, but like many Wyrd products it could be better. Wyrds casting quality is extra disappointing considering that it comes from a company that started as a manufacturer of collectors figures for display. I hear rumours that their production will switch entirely to “sprueless plastic” soon, which might help. I hope that it does. A note on basing: since I started the Malifaux project I have begun adding more and more bits and pieces to the large, flat 30mm slot bases that I have been using. The Malifaux rules tend to be generous regarding base size, so the simple (and most importantly fast) basing technique that I have been using for a couple of years just looked too plain. As the Malifaux project has progressed I have begun adding more and more bits to the bases, although years ago I promised myself that I was done with that sort of thing. It turns out that I was wrong. The cactus visible above is a symbol of this malady. Like the grass tufts that I started adding after I painted Santiago Ortega I liked the look so much that I went back and added cacti of various shapes and sizes to every Malifaux figure that I have finished so far. I imagine that tiny cacti will feature on every vaguely cowboy looking figure that I paint in future. They are cute though. Those cacti are sharp (no pun intended)! Did you make them yourself? If not, do you mind sharing your source? I dont mind in the slightest Christopher. 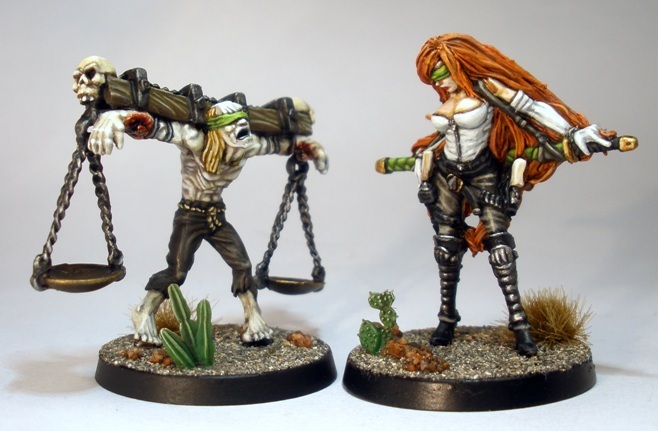 Cross pollination is what all of this miniatures blog stuff is about. I picked them up at Salute earlier this year but they can be found for sale in various places on the internet. Pegasus make two cactus sets. I bought both but only one of the sets is suitable for use as base decoration really: the plants in the other set are too large unless you plan to use them on a really big model.